Disney’s First Gay Character: What Is Representation? We all know Disney has become increasingly progressive in the past few years with its inclusion of more diverse casts, feminist movies, and empowering messages in its films. Following Frozen, a movie which focused on platonic love saving lives over romantic relationships, and Moana, the first movie with a Polynesian princess and a non-white cast with no male love interest whatsoever, Disney’s latest reformist step has sparked revolt across every variant of opinion: in the live-action remake of Beauty and the Beast, Disney has unveiled its first openly gay character. Unsurprisingly, this has led to loud controversy — from my mother complaining about it over dinner to the movie being banned in an Alabama drive-in theatre and in countries like Kuwait and Russia, where gay rights are next to nonexistent. However, the strongest resistance to this news came from the LGBT community itself. The whole point of LGBT inclusion is to break stereotypes rather than enforce them, but in ‘Beauty and the Beast,’ Disney seems to be doing the latter. They repeat harmful tropes the film industry has been using for decades: creating gay characters as goofy sidekicks whose only purpose is to liven up the movie, as well as the justification of abusive and manipulative relationships. So the controversial question is this: what is and isn’t progressive representation? 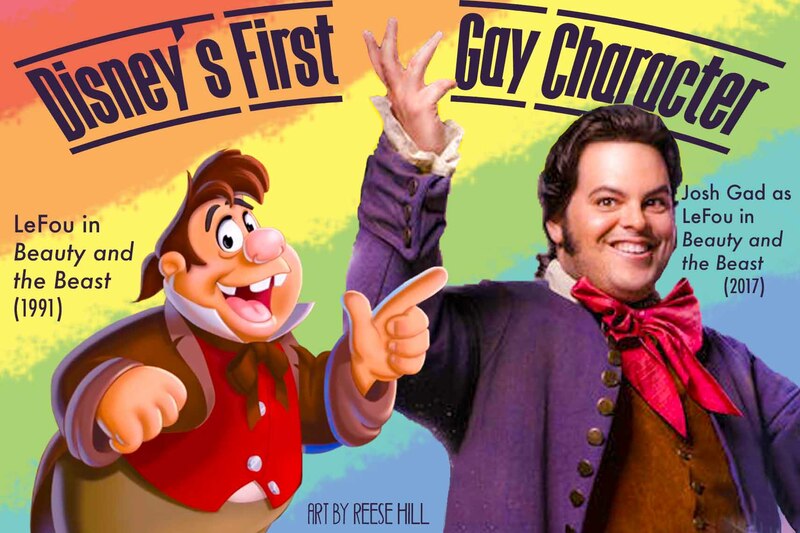 Many agreed that while Disney’s inclusion of a gay character is a great step forward, they made the wrong decision about who they used to represent the LGBT community. Several even had their own ideas as to who Disney could have chosen instead. But some who were originally opposed to the idea, like Glenn and myself, found our opinions had changed once we saw the remake. Lefou became a much more developed character in the live-action film than he ever was in the cartoon, and he was even given a redemption arc and a happy ending. In fact, this double-sided issue of Lefou’s sexuality has led to discussions about how Disney will continue their diverse inclusion in the future and if they’ll improve how they deliver it. While Lefou was a sketchy choice, many believe Disney will use him as a platform to leap off of into greater representation and equality. Progress only counts, of course, if it’s followed through. And perhaps Disney should listen to feedback from their audience to understand what proper representation really means. After all, marginalized peoples are going to have the best advice on how to encourage and preach acceptance for discriminated groups. Thankfully, Lefou, however questionable of a decision, is a promising sign for Disney’s future films and projects. And perhaps, even, it’s a sign of optimism for the entire film industry.